* Eight pre-generated characters, complete with personal backgrounds and detailed personalities. * Briefing sheets which explain the rules simply and succinctly. Your players do not have to read the game to play in this story; these one-page briefings are all they need. 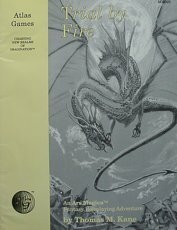 * An adventure designed to guide you (the Storyguide) through your first Ars Magica story. * Begin Play in half an hour or less. 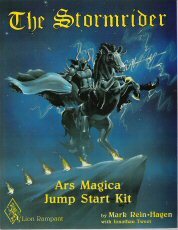 All you need to do is to read this kit beforehand, and review selected chapters from Ars Magica itself. 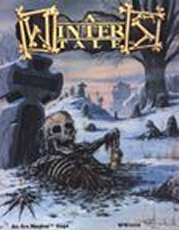 * No mere dungeon crawl, this story explores the full mystery and scope of myths and legends. A story in all senses of the word." • Mormool's challenging and intricate Veil of Riddles, which one must solve in order to reach Calebais. More than a cliched plot device, this riddle makes sense in terms of the story. • An inside look at a wizards' covenant, a source of ideas for the players' own home. • Rules for intriguing ghosts which give them new vitality, interest, and possibility. • A great variety of role-playing opportunties with MFCs whose personalities are clearly defined and believeable. Role-playing tips for each major character maximize your acting talents. • Profusely detailed with realistic and innovative encounters and "finds." Creatures to talk to, to fight, and to flee. • At last, a "dungeon" that makes sense, whose inhabitants have reasons for being where they are and for doing what they do. • Cross-indexed and cleanly laid out — to provide flexibility and detail with minimal hassle. An adventure organized and written so you can actually use it, not just steal ideas." • Everything has been updated to 2nd edition Ars Magica™. • A new chapter featuring a medieval convent. This intricately connects the "dungeon" to the "real world"
• Mormool’s challenging and intricate Veil of Riddles. More than a cliched plot device, this riddle makes sense in terms of the story. • Rules for running elementals, adapted from 1st edition Ars Magica™. • Profusely detailed with realistic and innovative encounters and "finds." Creatures to talk to, to fight with, and to flee from. • From the original edition many additions have been made, and the "missing" sixth chapter has been returned." "The Schism War -- Forgotten by Some, Continued by Others. Mysterious pools of blood have begun to appear around your covenant and the magical aura has slowly begun to disappear. What is the cause of this curse and can it be stopped before the covenant is destroyed? 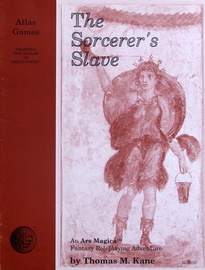 The fate of the entire Order of Hermes is in the characters' hands, as they must struggle against a mysterious foe whose powers and motives are not understood. Their success is not assured." • A 3 panel Storyguide's screen. With all the charts you will need to play Ars Magica. 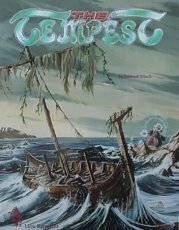 • 16 complete grogs, with fully detailed personalities (so you don't have to roll them up yourself! ), vivid examples of what grogs can be. 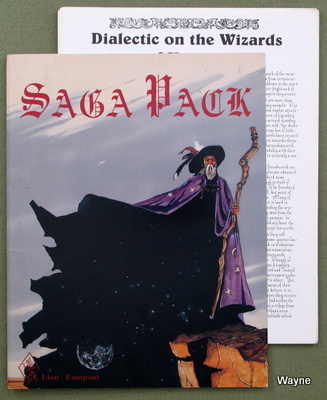 • Numerous briefing sheets on the Art of Story Design, Life of the Grog, Creating Companions, Limits of Magic, Mythic Europe™, the Code of Hermes, as well as many excerpts from the various Tomes of the Order of Hermes." 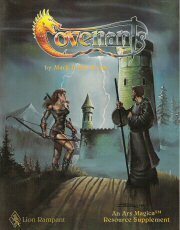 "This supplement is a guide to the complete covenant and contains all the information you will need to create your own, unique wizards' covenant. These simple rules, by having you choose from a multitude of different attributes, allow you to create any sort of covenant you desire. You have in your hands the key to transforming your Ars Magica Saga. Make it as detailed and complete as your characters. The covenant will become the central character in your Saga, one which all the players share, and here at last it is given fair treatment — and more. 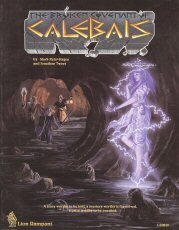 For any fantasy roleplaying game, this makes an excellent guide to that most enigmatic of all institutions. Have a look inside — the mysterious home of the wizard implores you to enter!" "This long awaited supplement, is not just another ‘background’ book. Describing a fantastic society of wizards, it will add an amazing level of depth, realism, and charm to the wizards of your roleplaying campaign. The mysteries of apprenticeship, the ambitions of potent magicians, their views of "lesser" non-magical society, and the long, hard path from apprentice to Arch-Mage all come to life within these pages. This supplement gives magicians the broader scope and detail that such interesting characters deserve. 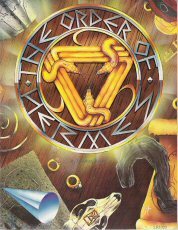 You are given an inside (and rare) look into a most secretive institution and its members, the enigmatic Order of Hermes, making it an invaluable supplement for any roleplaying game. Herein is a complete and detailed description of an arcane society of wizards — your magus will never be the same. • Scores of ideas, leads, and clues for stories and adventures." 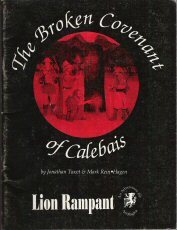 Magi of the players' covenant are invited to the court of the Viscount Stutt von Orstadt, in the Lorraine region of France, at the behest of Lady Claire, a member of the court. When the PCs arrive, they find that their would-be hostess has been accused of attempting to poison the count! Can they find if she's really guilty — or who is responsible — while avoiding suspicion themselves, and winning access to the viscount's treasured, magical Seir Waters? When a novice sorcerer of the covenant, dispatched as a messenger, disappears, word returns that he unleashed a nameless horror from the wood known as the Copse of Skulls. Now the player characters are dispatched to rectify the situation, and free the sorcerer — if he yet lives. 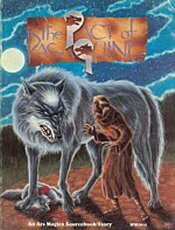 To do so they must face bandits who are not quite human, and the forest's monstrous master — to whom the ancient pagan Celts sacrificed human skulls; as well as challenges of a more subtle character. A horribly mutilated body floats downstream to the players' covenant. It is discovered that the pox killed the unfortunate girl — and afterwards someone did this to the corpse. What evil brews upstream? Diabolists, a necromancer, or worse? In the course of their investigations, the characters encounter a bizarre priest, twisted by lies and secrets of the dark past, who has lost much of his hold on reality. What evil fate awaits him and the investigating adventurers?" "Almost thirty years ago, a female wizard of the covenant bore a son and named him Andros. As he grew, the other magi realized that Andros understood magic at a level the scholars of Hermes could not comprehend. He knew the future and the past; he could see and speak with spirits. But then, quite suddenly, the youth acquired a great fear of magic, and soon thereafter ran away. Today the name of Andros is again spoken at the covenant, when a mysterious message arrives from Byzantium. The letter reports that Andros lives as the slave of one Farad Sahda, 'The Old Physician,' a conjurer of the Black Sea. The letter's writer enjoins the covenant to rescue its offspring - who, with his master, will soon be in Constantinople. Constantinople, the magnificent capital of the mighty Byzantine Empire, is but the first stop in this adventure of intrigue, mighty spirits, strange magic, and legendary places of the East!" "The town of De Panne faces a peril like none in Christian memory. Centuries ago, this province was under the sway of Pan Caudarax, the Dragon of Flanders. This beast has spent centuries in the fiery mountains of Iceland. 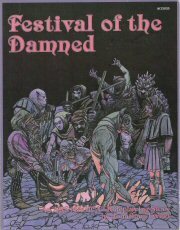 Now wizards learn that the dragon plans to return..."
"In Festival of the Damned, the troupe returns to Vezay, where the forces of Hell have rallied in the desecrated Church of St. Lazare. The magi have been invited to enjoy the pageantry of Easter Week, and to investigate a pouch of magical herbs. Witchcraft is suspected, but that becomes the least of the characters' problems in a week filled with peril and temptation." 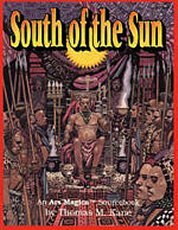 This official Ars Magica sourcebook takes the magi past the equatorial Ring of Fire to the strange and wondrous Lands South of the Sun — a mythic place legendary in the medieval mind. From their iron citadels, the Colossi of Dis rule their demon-haunted hills; the Queen of Niobia, monarch of the last refugees of ancient Carthage, leads Juno's rites of worship and Good King Prester John strives to forge a legacy of a united, Christian realm. Strangerwonders abound —from the mysterious river Physon, whose banks are lined with Jewels, to the fearsome Sphinxes of the Veldt, and the enigmatic dream-sorcerers of the Horn Jungles. Experience fantasy with a new twist: A medieval vision of mythic Africa, laden with magic and mystery, extraordinary challenges — and appropriate rewards — for the Order of Hermes." 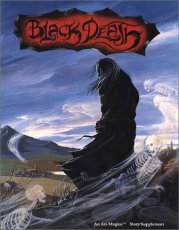 "Black Death is an adventure that pits the characters against a most fearsome foe: the plague. The town of Montrouge has fallen victim to contagion, and the neighboring covenant, Ad Vis Per Veritas, has fallen with it. If the characters hope to salvage Ad Vis Per Veritas, reunite its scattered magi and preserve its rich source of vis, they must risk the plague themselves. 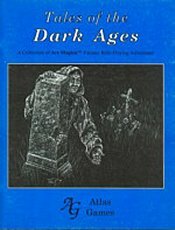 Though the may resist the Black Death and rebuild Montrouge, the characters soon learn that a more diabolical power is at work, that the plague may have had origins within the Order of Hermes itself...."
"There is a world that underlies Mythic Europe, a world of perfect beauty, living light, and dark horror - the world of the faeries. Follow the part-faerie troubadour Gerin as he pursues the faerie queen who stole his infant sister. Read first-hand accounts of faerie encounteres, given by wizards and peasants, holy men and diabolists. And learn the ways of prudent courtesy on which the lives of visitors depend in the faerie lands of Arcadia, a place where light and dark are directions as well as qualities, and where creativity can transform the very substance of reality. "This Ars Magica supplement presents five magical locales of Faerie, Magic, Dominion, and Infernal might, sites designed to be the foci of many different stories. These locales are unique because they are composed of regio, levels of magical potence. 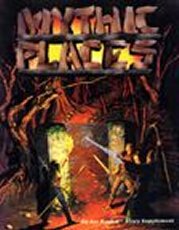 Each level characterizes a single mythic place in a new way so that each place really has several natures, not just that apparent to the mortal world Numerous story hooks also provide you with a wealth of applications for each locale." "For centuries the Pact has protected the peasants of Pasaquine from the enmity of Hrulgar, Prince of the faerie forest. But now the wolf cub of Hrulgar has been slain and the pack leader demands revenge. What sinister plot lies at the bottom of this horrible calamity and what will happen to the people of the village? More importantly, will this gnarled tree of events draw the covenant into its boughs and cause an irreparable rift between itself and the village? This supplement describes both the 'peaceful' village of Pasaquine and the nearby faerie forest in detail and depth. It also includes a connected story-adventure which will help bring your saga to life." "This Ars Magica supplement is part three in the Four Seasons Tetrology, and follows in the footsteps of The Tempest. Herein the Storyguide will find the information needed to organize the descent of your covenant from Autumn to Winter. This book consists of several interrelated adventures that detail the collapse and perhaps destruction of a once proud covenant."